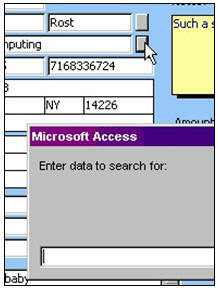 Access 307 continues our advanced Access database development with VBA programming. This class focuses on creating a custom search button for your forms - where you can place a command button next to a commonly-searched field (say, LastName) then click on it, type in part of the last name, and Access will search for it. We'll learn all of the VB code behind such a feat. We'll also look at dynamic combo boxes - where the values in the combo box can change or be changed by other fields. I'll show you an example where one combo box can be used to change the values in another (pick a state in one box and it shows you only cities from that state to pick from in the next one, for example). In the example below, you pick a sales rep, then the second combo box only shows that sales rep's customers, then once you pick a customer, the third combo box shows only orders for that customer. We'll learn some simple database security - I'll show you how to set up a database password. We'll see how to convert between different Access versions, and how to create a secure MDE file. 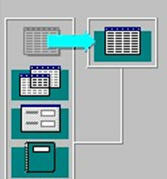 You can distribue an MDE file, which is a full working copy of your database, but nobody else will be able to access the Design View or VBA Code of any of the objects. I'll also show you the database splitter wizard. 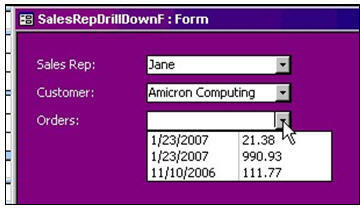 You can create a front-end database file that has all of your forms, reports, code, and queries, and a back-end database file that contains the tables. 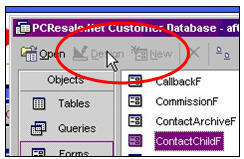 This is the preferred method for sharing a database in an office setting.